Just so we can get this out of the way, this is one of those KickStarter projects. You know, the type that require your funding in order to get it on the market, and you might be guaranteed the first one if you pledge enough money? 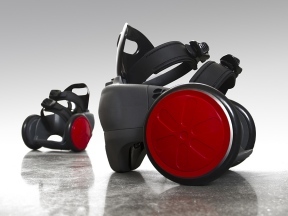 This is the spnKiX, and it is a pair of electric roller skates. I guess those Segways were not enough for us, and we had to come up with some form of single human transportation. The spnKiX are capable of about ten miles per hour, and they can only travel about two or three miles before the battery runs out. Want to go further? Well, you will have to wait about two hours as the lithium ion battery charges. So I guess what we are looking at is way to get around for short distances. For example, if you only have a few miles to go to work, you can charge them up while you are on the job and electro-skate home. If you pledge about $375 at the Kickstarter site, you will find that you can get yourself a pair after the Kickstarter member raises $25,000 for production. If you are willing to pledge about $950, then you can get a special edition with matte black wheels. Super Bowl XLVI to be streamed live!